If you know me at all (even just a tiny bit), you know I love me some dark chocolate. What you may not know is that I also love peanut butter. And when you marry the two, you get this… Peanut Butter & Co.’s Dark Chocolate Peanut Butter. Obviously, I love it. It’s horrible on the hips, but it tastes oh so good. When this week’s SMS was announced, I knew exactly which PB I was going to use. And into the cabinet I went (because I always keep this on hand). They turned out perfect… soft, chewy, a little crunchy on the edges with that smooth nutty aftertaste. The chocolate flavor wasn’t as prevalent, but it was still there. After these, though, I don’t know if I can go back to regular ‘ol PB cookies! oh my! these must be so so good! 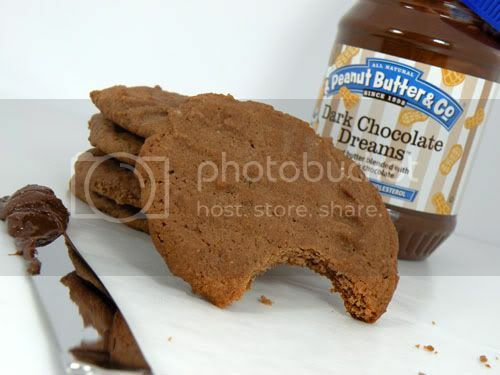 OK, I just posted about how I don’t really like PB cookies, but these look AMAZING! I’m putting that PB on my grocery list and I must try this version! Woah, Jessica, you definitely hit this one out of the park! I’ve never heard of that brand of peanut butter! Your cookies look yummy. Great Idea to use chocolate PB. Your cookies look tasty. I doubled this recipe and IM so glad I did. It was the best! Oh wow, I don’t think I’ve ever seen chocolate peanut butter in my local stores! It sounds amazing and I bet it made these cookies even better than they already were 🙂 Great photos – the cookies look perfect! I’ve never even heard of that stuff! Where do you find it?? These cookies look great!! Oh my these look delicious and decadent:) I have to try these immediately! So I could see these being addictive! Yummy!! DARK CHOCOLATE Peanut Butter sounds so sinful and yet so scruptious! Wow, your cookies look delicious! I’ve never seen chocolate peanut butter, what a splendid idea! I will definitely look for it. Your cookies look great. Love the chocolaty color. Yum yum yum! Those look fantastic! OHHHHH, I need to find some of that PB & Chocolate, yummy!!! A guy at my work eats the white chocolate kind. 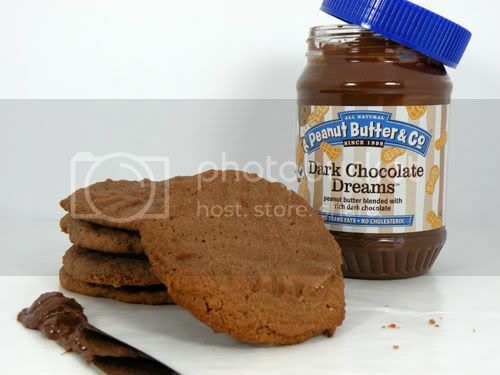 I’ll have to try the dark chocolate- that would be sinfully good in peanut butter cookies! Previous post: Julie & Julia… "Bon Appetit!"